You are here:Home » Blog » Festivals & Events » Too close to be true, Get Egg-cited! The Easter Holidays have officially begun! 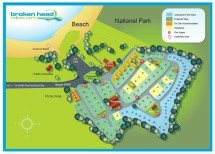 Broken head Holiday Park is in full swing ready for the busy times ahead! With Easter and the Blues Festival on at the same time! We are beginning to welcome our guests for both of these special occasions. We are equipped with Easter Eggs to feed a small army and are extremely excited to share some new memories with our guests. We can assure that Easter 2011 will be an extra special and memorable one for you and your family. HOP to see you here soon! Jess, Sharni, Bianca, Luke and Linda!